With Stalin's scorn and Soviet indifference, deaf people in Russia have not had an easy time. Even now, they live in limbo. Russian sign language is not officially recognized, and many say social attitudes can be a problem too. Deaf people in the country want Russian sign language to be accorded the status of an official minority language. A recent conference devoted to the problems of people with disabilities attracted attention to the challenges faced by the hearing impaired. Deaf actor Aleksey Znamensky cannot hear a song and yet he can sing it - with his hands. He says that he speaks the most beautiful language in the world. "Sign language is a visual language, it's vivid," Aleksey says. "You can invent a lot of things with it - things you can't do in the language of words." Despite living in a world of near-silence, Aleksey and his fellow performers put on a show full of life and music. The audience appreciates it, as a theater of deaf actors is a rarity in a world mostly hostile to those speaking with their hands. "It's a panacea to me - without theatre, without acting, without art - I die!" says a deaf woman from the audience. Even their language does not officially exist. All previous attempts to pass a law giving official recognition to Russian sign language have failed. The problem dates back more than 70 years, when sign language was banned from Soviet schools. In 1950 Stalin made the situation even worse by calling it "not even a surrogate language". Despite what some might think, it is not a primitive way of conveying basic information. It is a fully fledged language capable of expressing just about anything. Valery Rukhledev, the head of the All-Russian Federation of the Deaf, believes there are more than ten million hard-of-hearing people in the country, yet he says there are no interpreters, no TV channels catering for the deaf, almost nothing to ease their interaction with the world. "To my surprise, our officials count the money in a very strange way," Valery Rukhledev says. "They believe there's no need to spend a lot of money on the disabled. That's where the problem comes from." Tatyana has three siblings, but she is the only one in the family who is deaf. "It's hard to communicate at work, everywhere," she says. "No one understands us - it's inconvenient to write on a piece of paper. And people have cold hearts. It's rare to see a nice attitude." Recently there appeared the first beauty shop for the hard-of-hearing in Russia, and it has a staff interpreter. "It's like being at home here," a beauty client says. "You can chat, ask questions, say what you liked or disliked. At other hairdresser's you feel constrained. Here they are attentive. I feel respected here." 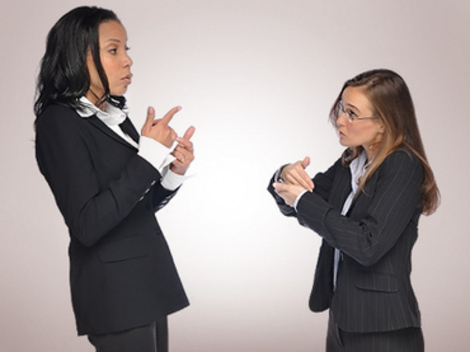 If sign language is officially recognized in Russia, the lives of deaf and hard-of-hearing people will become easier. However, it would be only the first step in making life sound the way it does for hearing people.